Cellist/composer Jonathan Golove is a native of Los Angeles, California and a resident of Buffalo, New York, where he serves as Associate Professor in the University at Buffalo’s Department of Music. Mr. Golove’s career is marked by its versatility, sense of adventure, and commitment to the performance of both new and traditional works, as well as of improvised music. He has been featured as soloist with the Buffalo Philharmonic Orchestra, Slee Sinfonietta, New York Virtuoso Singers, and, as a baroque cellist, with the USC Early Music Ensemble. He has recorded for the Albany, Centaur, CRI, Albuzerque, and Nine Winds labels, and his performances and interviews have been broadcast by numerous National public radio stations, as well as the West German Radio, Radio Nuevo León, and Radio France. His summer festival appearances include the Sebago-Long Lake and Roycroft Chamber Music Festivals, as well as numerous festivals devoted to new works, including June in Buffalo, the North American New Music Festival, the Aki Festival of New Music, and the Festival del Centro Histórico, Mexico City. A member of the critically acclaimed Baird Trio, Mr. Golove is a former member of the Elisha and June In Buffalo String Quartets, and has performed as a guest with the Cassatt Quartet and the Cleveland Octet. Mr. Golove is also active as an electric cellist, particularly in the field of creative improvised music, and he is one of a handful of performers on the historic theremin cello. He has performed and recorded with groups including the Michael Vlatkovich Quartet, Ubudis Trio, and Vinny Golia’s Large Ensemble, and made appearances at the Vancouver Jazz Festival, the Eddie Moore Jazz Festival (Oakland), and the International Meeting of Jazz Musicians (Monterrey, Mexico). He has also been honored to perform with such leading figures as Andrew Cyrille, Rashied Ali, Sonny Fortune, Ramón Lopez, and Andre Jaume. Mr. Golove gave the first performance of Varese’s Ecuatorial using Floyd Engel’s recreated theremin cello in 2002, and he played the work with the Asko/Schoenberg Ensemble this past year at the Holland Festival (Amsterdam) and Festival d’Automne (Paris), and more recently with the London Sinfonietta at the Southbank Centre. He will bring this historic instrument to New York City for a performance at the Lincoln Center Festival in July 2010. 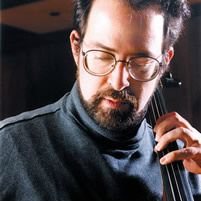 Mr. Golove received his undergraduate education at the University of California at Berkeley, where he was a cello student of outstanding Bay Area cellists Bonnie Hampton and Stephen Harrison. As recipient of an Alfred Hertz Traveling Fellowship, he spent a year abroad studying with contemporary music legend Siegfried Palm in Cologne, Germany. He earned a Masters degree in cello performance from USC, studying with LA Philharmonic principal cellist Ronald Leonard.